This article is about the yellow lightning bolt. For a dog character from the Saturday Supercade episode Junior Meets Kid Dynamo, see Lightning (character). For a captain command in the Minion Quest: The Search for Bowser mode of Mario & Luigi: Superstar Saga + Bowser's Minions, see Lightning (move). A shiny yellow lightning bolt. Lightning (also called Thunder Bolt, Lightning Bolt, or Shock) is an attack item found in various Mario games. On its use, it summons a powerful lightning bolt from the sky, usually shrinking opponents. In the Mario Kart series, Lightning is an extremely powerful item that racers usually receive when they are in (or near) last place in a race. When used, Lightning will temporarily shrink all the other racers, making them slower and weaker, in addition to making them spin out and drop their items. It also temporarily makes the racers' voices high-pitched and sped up until being back to normal or getting squashed. It is also the emblem for the Lightning Cup. Since Mario Kart 64 until Mario Kart: Double Dash! !, when Lightning is used, a sound like that of a tiny alarm is heard during its effect. In Super Mario Kart that sound is only heard when the Lightning is launched, and in Mario Kart DS onwards, the music in the race is affected when the player is hit by it. In Mario Kart 7, the extra beat that plays in 1st place goes out of sync with the music for a few seconds after the attack. Lightning's effect can be avoided if a racer has a Mega Mushroom, Star, Boo, or Bullet Bill item activated when the bolt strikes, or if they are flying through the air after being shot out of a cannon (except in Mario Kart 7, Mario Kart 8 and Mario Kart 8 Deluxe). In Super Mario Kart, if any shrunken players are driven over, they will be squashed and unable to move for a few seconds. While shrunk, the character's weight is equal to other shrunken players. Lightning returns in Mario Kart 64, behaving the same as in Super Mario Kart. However, if two shrunken players run into each other in Mario Kart 64, they will both crush each other. Lightning returns again in Mario Kart: Super Circuit, behaving like in Super Mario Kart. Princess Peach, Wario, and Bowser are the only three CPUs that are able to obtain the item. In Mario Kart: Double Dash! !, Lightning can also scatter racers' items across the road when used. However, the item does not affect players that are currently indisposed (such as having just been hit by another item, or having fallen over a cliff). Also, unlike in Super Mario Kart, Mario Kart 64, and Mario Kart: Super Circuit, shrunken players will not get squished if they ram into normal sized racers. However, tiny karts will be easy to push around, even by the Bullet Blaster, which is the lightest kart in the game. Lightning can be dropped on the road after getting hit by something that causes racers to lose their items (e.g. Freezies). However, the Lightning will only stay on the road for a few seconds. In Mario Kart DS, the effect of being hit by Lightning wears off much faster depending on the rank that the player is in. For example, someone hit by one while in seventh place will return to normal almost immediately, while the one in first place will remain shrunk for up to seven seconds. Also, players who get hit by other items can still be affected by this item. In Mario Kart Wii, as in Mario Kart DS, the effect of Lightning lasts more briefly the lower the rank the player is in and even if hit by other items, they are still be affected by it. If the players are under the effects of a Mega Mushroom, they will shrink to back normal size immediately and won't spin out or lose their items. In Battle Mode, unlike other items, Lightning does not take away a balloon or coins. In Mario Kart 7, as in Mario Kart DS and Mario Kart Wii, the effect of being shocked by Lightning will be determined on the level rank the player is in, from last place decreased time and in first place will last the longest. As before, the music of track will be altered and even if hit by another item, the player will still go into effect. Any players that are shrunk will also be squished if run over by normal sized racers, an effect returning from Super Mario Kart, Mario Kart 64 and Mario Kart: Super Circuit. Unlike in Mario Kart Wii, when a driver is shot out of a cannon, the shrinking effect will still happen and the driver will fall while gliding in midair. A new addition is this game is multiple Lightnings. Up to three players can hold a Lightning Bolt at a time and could be possible to unleash two or even three lightning attacks. In Mario Kart 8 and Mario Kart 8 Deluxe, the effect of this item is very similar to its effect in Mario Kart 7. In these games however, when a character is shrunken, the loss of speed makes it more difficult for the player to perform tricks and to drift. 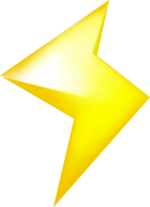 Unlike in previous Mario Kart games, when a player is hit with Lightning, they will lose the item they are holding even if they are under the effects of a Star (in the original version only). Like the first three games and Mario Kart 7, when a player is shrunken by Lightning, and another one with the normal size drives on them, they will be squished. Up to three players can hold a Lightning Bolt at the same time. Lightning appears as an item in Mario Pinball Land. When used, it defeats all on-screen enemies. In Mario Power Tennis, Lightning appears as an item in the Item Battle in Exhibition Mode. When it is used, it shrinks the player's opponent(s), making them unable to run faster to get to the ball. In Mario Superstar Baseball, Lightning is one of the items resulting from landing the ball in the ? space. If the player receives that, they will switch with the leading player's coins with their coins. In Mario Super Sluggers, Lightning appears as an error item, but only in Toy Field, where the losing player may receive it. In Mario Hoops 3-on-3, Lightning is a usable item. If it is used, it stuns all players and makes the ball drop out of one's grasp. While Lightning itself does not appear in Mario Party 8, it cameos on the wrapper of the Cashzap Candy. In Mario Party 9, Lightning appears in King Boo's Puzzle Attack. Lining three of them will give ten points to whoever lined up three of this item, while taking away three points from his/her opponents. It also unleashes lightning that will damage King Boo more than the other items do. In Mario Party: Island Tour, Lightning is referred to as Lightning Score Strikers and subtract three from an opponent's roll. Lightning reappears in Mario Party: Star Rush as a usable item in Coinathlon that, when used, stuns an opponent for a few seconds. In Mario & Sonic at the Olympic Games it appears in the Dream Races where it also makes characters shrink and slow down. If the player uses it, all fielders would get stunned by it while the player may get coins resulting from the stun. Lightning appears in Super Smash Bros. Brawl, Super Smash Bros. for Nintendo 3DS / Wii U, and Super Smash Bros. Ultimate as an item. It also appears as a sticker. The item usually shrinks all of the player's opponents. However, at times it might backfire and shrink the player who grabbed the item. Lastly, there may be a case in which the item might actually make the opponents giant-sized, as if they all touched a Super Mushroom. Players grab this item in the same way that they grab the Super Mushroom and Poison Mushroom; the player has to only touch the item to activate its effects. An interesting note to point out is that players who get shrunk by the Lightning will be set to the exact same size as when they touch a Poison Mushroom (0.5x normal size), but their direct attacks deal 0.7x their normal damage, instead of 0.6x. Also, if players become giant from the Lightning, they will be much bigger than when they grab a Super Mushroom (2.4x normal size, instead of 1.7x), and their direct attacks will deal 1.84x their normal damage. 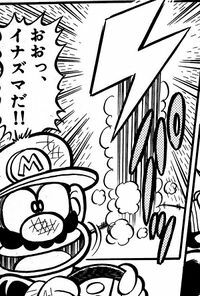 Lightning makes a brief appearance in volume 6 of Super Mario-Kun. While struggling, Mario receives this item and then uses it to pulverize Donkey Kong Jr. and win the race. SNES Super Mario Kart An item that goes off the moment you touch it. It may shrink every other character on the screen. Tiny players suffer a reduction in their attack power and become easier to send flying. After a set amount of time, all the characters will return to their normal sizes. In the Mario Kart series, all players but the item user shrunk, and get flattened when run over. Wii U Mario Kart 8 (05/2014) If there is one thing I've learned from Mario Kart, it's that lightning can strike without a cloud in the sky. Picking this up will hit your foes with a character-shrinking blast of lightning, making them really easy to launch into the distance. If you get struck, you'd best run until the fight is fair again. Don't let sunny weather fool you! Lightning can strike at any time. This mighty force of nature can make you feel small...and actually make you small, too. In this state, you'll be quite weak and easily launched, so just try to stay out of everyone's way until you go back to normal. THEN you can get your own back! This page was last edited on March 2, 2019, at 00:42.